Hyleton wifi smart power strip can help you to arrange your household appliances efficiently and make your life intelligent. You just voice control them by Alexa or google home, or remote control them by cellphone from anytime at anywhere. 1. Plug the smart power strip socket into a three-prong outlet, you will get a rapid green flashing light blink. 3. Back to the menu, and press the "Smart home" button, Click "Add Devices", then click "Confirm indicator rapidly blink". You'll see "Connecting now". When it comes to 100% connected, you've already "Successfully added 1 device." 1.The smart power socket supports 2.4Ghz Wi-Fi network only. ♥ ALEXA & GOOGLE ASSISTANT COMPATIBLE: The wifi smart power strip can be voice controlled by Amazon Alexa and Google Assistant. 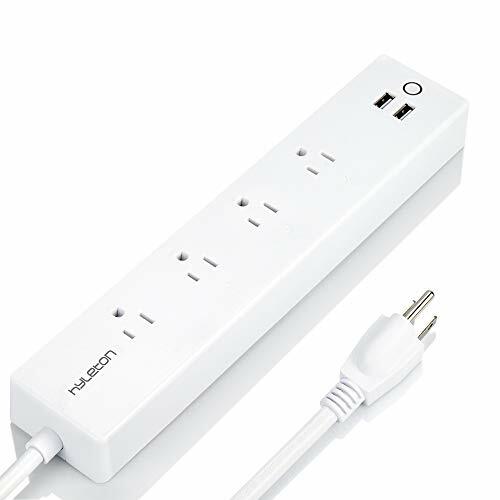 ♥ TIMING FUNCTION: Schedule your wifi smart power strip to turn on or off anytime as pre-set time, you can set up the time separately for each AC outlet as you needed. Each wifi smart power strip can set up to 20 groups of timing tasks. Share access up to 30 smart cellphone control. ♥ USE SAFETY: The wifi smart power strip is equipped with surge protector, overcurrent protection, overload protection, over-heated protection and anti-lighting protection, can effective absorb the sudden huge energy, protect your equipment and your home safety. It also have a separate safety door to prevent children and pets accidentally touch the socket, keep away from danger. If you have any questions about this product by hyleton, contact us by completing and submitting the form below. If you are looking for a specif part number, please include it with your message.